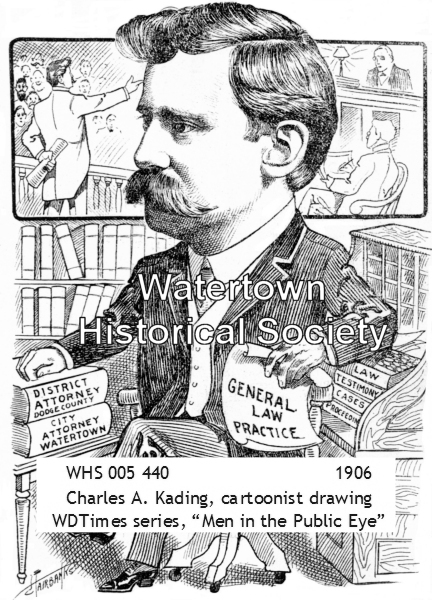 07 12 C. A. Kading, of Watertown, who is at the Plankinton, is an attorney who is so modest that he fears publicity. He says: "I never feel that a beginner like myself should ever get into the public prints. If I was an old and successful practitioner like Jim Malone or Judge Lamb of our town, you could no doubt get an interesting talk out of me. Now I am obliged to hide my modest rush light under a tin can or a half bushel." 04 11 There is no earthly reason why C. A. Kading should not again be elected city attorney. He has been a very efficient official and deserves re-election at the hands of the common council as an endorsement for services faithfully rendered. The same is equally true of Frank S. Weber, our respected and painstaking and efficient city clerk. The city never had a better one and it is always good business sense and judgment to keep good men in office. The Leader has not heard any opposition to either of the gentlemen named and there probably will be none, for all recognize their worth in the positions they held. 06 03 District Attorney C. A. Kading came up from Watertown last Tuesday in his new Overland auto. It is one of the “slickest" looking cars that has come to Juneau for some time. Mr. Kading was accompanied by District Attorney R. W. Lueck, of Jefferson County, and by Attorney Otto Hahn of Watertown. [Juneau Telephone]. It is seldom that a candidate for public office gives such general satisfaction to the voters and taxpayers that he has no opposition at the primary election from within his own party for a third term, and especially when that office has a good salary attached to it—such is the case, however, with Charles A. Kading of this city, candidate for District Attorney of Dodge County on the democratic ticket. Mr. Kading's administration of that office for the past four years has been so eminently satisfactory that his party decided to renominate him and did renominate him at the primary election last September without opposition, and without solicitation or effort on his part. In addition to what I have already stated in connection with my candidacy for the office of Mayor I desire to say, that if elected, in addition to my official duties, I will do my utmost for the benefit of the laboring man, as I have done heretofore, by working in conjunction with the Advancement Association to interest manufacturing concerns to locate in our city, thus encouraging and benefitting the laboring man in the employment that it will bring to him in the building of factories, as well as in operating the same after constructed, and avoid the necessity of so many of our boys leaving the city in order to obtain employment. I have always contributed liberally towards the bringing of factories to our city, as will be borne out by the records of the Advancement Association, and have never regretted doing so, because each factory secured for Watertown has been a benefit to its citizens generally. The industries already located here, should also be encouraged, as their owners are heavy taxpayers and they are a benefit to our city and should be given every possible and reasonable courtesy in the way of proper fire and police protection. If elected Mayor, I shall give to the performance of the duties of that office the best there is in me for the benefit of our city, its business and manufacturing industries, and all of its people. Being a heavy taxpayer myself, I would naturally strive to accomplish the most beneficial results for the citizens at the least possible expense to the taxpayers. A Large Vote Cast at the Municipal Election. The municipal election on Tuesday turned out to be a lively affair after all, judging from the large vote cast, which was 2,003. Chas. A. Kading was elected mayor by a plurality of 19 votes. Kading received 828 votes, Mulberger 809, Gaebler 296, and Richards 70. Emil Tanck for treasurer received 1473 votes and C. H. Bramer 422: Krueger for assessor 1039 and Schmutzler 837; Wieman for city attorney 1501 and Buchheit 359; Glaser for street commissioner 1063 and Radtke 835. Mayor-elect Kading says of course he’s happy over the result and is very thankful to all who supported him for the office, and bears no ill will toward those who supported his opponents, and that he will strive hard to do his duty and look well after the city’s interests in his official capacity. A wedding of charm and impressiveness was solemnized at the home of Mr. and Mrs. Charles F. Mahin, 1218 West Superior Street, Saturday morning, at 10 o'clock, when their niece, Miss Josephine Nelson, became the bride of Charles E. Kading, son of Congressman Charles A. Kading of Watertown, WI. The bride is the daughter of Mrs. Edward Nelson of Waupaca, .WI. Kokomo is the girlhood home of the bride's mother and although the bride herself has never lived here she has visited in the city frequently, she and her mother having spent much time with Mr. and Mrs. Mahin since the death of Mr. Nelson about four years ago. The Rev. W. Edward Hoffenbacher, rector of Trinity Episcopal Church at Logarisport, performed the ceremony in the presence of the immediate relatives and a few close friends of the couple. The service was read at the east end of the living room and decorations of cathedral tapers in two tall wrought iron holders and two floor jars of hollyhocks in shades of pink, delphinium and Shasta daisies made a lovely setting for the service. For the exchange of vows the couple knelt on a cushion colorful with Chinese embroideries. The attendants were Miss Eleanor Fragstein of Milwaukee, Wis., a sorority sister of the bride, and Robert Godley of Cleveland, Ohio. The bride, who was given in marriage by her uncle, Mr. Mahin wore a quaint dress of figured white chiffon, the design being of baskets of old-fashioned flowers in the dainty pastel shades. The dress was fashioned with extremely long skirt and fitted bodice and a narrow ruffle around the neckline formed its only trimming. A jacket of matching chiffon lined with pink satin was worn by the bride during the breakfast. She wore a pink hairbraid hat, an off-the-face model, trimmed with a wreath of pink roses across the front and a bow of pink grosgrain ribbon at the back, pink moire slippers, flesh hose and pink silk mitts. Her only jewelry was a silver and sapphire necklace, the gift of the bridegroom, and her flowers were a Colonial shower of lilies-of-the valley and Briarcliff roses. Miss Fragstein wore a period dress of light blue chiffon, having a long full skirt and tight bodice. Her hat of hairbraid matched her dress in color and she wore blue slippers arid light hose. Her flowers were a Colonial bouquet of Briarcliff roses and delphinium. A breakfast for the wedding guests was given at the Kokomo Country Club immediately following the ceremony. The long table was beautiful in its floral decorations. At either end was a French crystal bowl of roses, phlox, delphinium and baby's breath and alternating between these were porcelain figures and crystal bud vases, of roses and delphinium. The place cards were brides and grooms with wisps of tulle forming the bride's veil. The other tables about the room also had lovely bouquets of 6 vari-colored flowers. The wedding cake, which the bride served, was decorated with pink roses and other adornments. Following the breakfast, Mr. and Mrs. Kading left on a motor trip through the east, the bride wearing a brown silk suit with a chartreuse blouse and beret. Her other accessories were of brown. 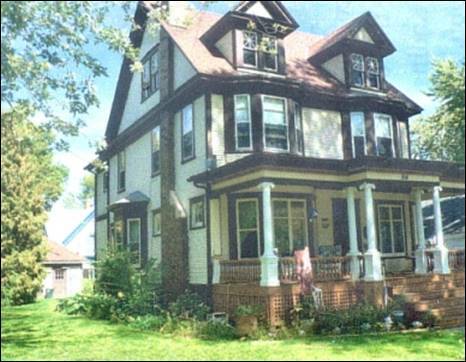 After August 15, they will be at home at 914 Clyman Street, Watertown, Wis. Other out-of-town guests with the bride's mother and the attendants were Charles A. Kading, father of the bridegroom, Edward Schempf and William Brandt of Watertown, A. E. Backus of Milwaukee, Wis., Miss Frances Wright of Oak Park, Ill., Miss Lucy Newell of Evanston, Ill., Miss Virginia Tittman of Chicago, Mrs. C. G. Beeching of Detroit, Mich., and Mr. and Mrs. Howard Bunn of Rochester. The bride attended Ward-Belmont Seminary, and was graduated from the University of Wisconsin. She is a member of Alpha Xi Delta, women's national fraternity. Mr. Kading was graduated from the law department of the University of Wisconsin and is a member of the Chi Phi fraternity. He is junior member of the law firm of Kading and Kading in Watertown. 09 17 Attorney Charles A. Kading receives a life membership card in the Elks Lodge. KADING, Charles August, a Representative from Wisconsin; born in Lowell, Dodge County, Wis., January 14, 1874; attended the country schools, Lowell graded school, Horicon High School, and the University of Wisconsin at Madison; was graduated from the law department of Valparaiso University, Valparaiso, Ind., in 1900; was admitted to the bar the same year and commenced practice in Watertown, Wis.; also interested in agricultural pursuits; city attorney of Watertown 1905-1912; district attorney for Dodge County, Wis., 1906-1912; mayor of Watertown 1914-1916; elected as a Republican to the Seventieth, Seventy-first, and Seventy-second Congresses (March 4, 1927-March 3, 1933); unsuccessful candidate for renomination in 1932; resumed the practice of law; died in Watertown, Wis., June 19, 1956; interment in Oak Hill Cemetery. 12 29 Charles E. Kading, Watertown, and William Brandel, Jefferson, Jefferson County judges-elect, will be sworn into office at a special ceremony to be held in the county court rooms of the new courthouse addition in Jefferson. The rites will take place at the opening of a regular term day of the court at 9 a.m. on Tuesday, Jan. 2, 1962. Retiring County Judge L. L. Darling will administer the oath to his successors. The public is invited to attend. The new judges will be extremely busy immediately following their installation. It is reported that more than 40 cases are already scheduled for hearing before Judge Brandel on Jan. 2. In Branch 1, Judge Kading will continue with the regular probate calendar which is reported to be heavy. Sept. 30, 1956: Charles E. Kading, 1008 South Tenth Street, Watertown, attorney and former member of the City Council, prepared today to take over the duties of acting city manager of Watertown following his election by a 3 to 2 vote in the Council last night. The election of Mr. Kading came as no great surprise. On Sept. 22, in a front page report, the Times forecast the possibility of his election. He will serve until a new city manager is elected by the Council to succeed to the position of Dean Van Ness who completed his services with the city today. He will take over his new duties as the first city manager of Lake Geneva on Monday.